I’ll be in Tucson for work next all next week, staying at the supposedly luxurious Loews Ventana Canyon Resort. Many thanks to Otis Gospodnetic of Simpy for putting me in contact with Benjamin Reitzammer. Benjamin has graciously set up the GrabPERF measurement script on his server in Zurich. Now that the Europeans have a growing presence on the GrabPERF Network, we need some locations in the US and Asia-Pacific. Avarice, it is thy failing. Stupidity is pretty high on the list, too. Thanks to the generosity of Henrik Sjostrand of Netvouz, there is now a measurement location up and running in Gothenburg Sweden. You will find it listed in the data as Gothenburg Sweden #1. I have had a few other parties expressing an interest in hosting a measurement agent, but there is always room for more measurement locations! Send me an email if you can host a site! I said, "I’m crazy ma, help me." ‘Cos it runs in the family." Some would call it old school. I call it classic. I love pencils. They have a depth of emotion that you can’t get with any pen. But the highest standard in industrial pencils are not the 0.5mm mechanical pencils that everyone uses. No, it’s the 2mm leadholder. I first used these in my drafting overview in Grade 8 shop class. I sucked at drafting, but these felt good. I just rediscovered them, and have found that there are many people who share my love of these old leadholders, including the folks at leadholder.com. The most prevalent ones are the Staedtler 780s, and their cheap copies. 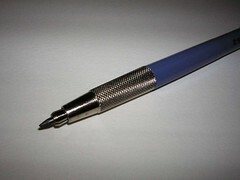 The pinnacle of leadholder lust: the Caran D’Ache Fixpencil 2. Caran D'Ache Fixpencil: Where do you buy them? I live in the Boston area. I want to buy one (1) Caran D’Ache Fixpencil 2mm leadholder. The only place I can find them is from an online store in Switzerland. Got my invite to Joost today. Downloaded the app and tried to use it. And even on my reasonably powerful laptop, the memory, CPU and network usage went through the roof. This morning, after months of increasing performance issues, and connectivity issues, I have retired the Boston Verizon measurement location. This location hosted 2 measurement agents. The machines, hosted in my basement, are connected using Verizon FiOS, which has become increasingly flaky over the last couple of months. As well, the machines are 7 year old Pentium IIs, and require a substantial amount of spoon-feeding that I don’t have time for at the moment. I have re-enabled the Technorati #1 Agent to fill the gap, but this leaves only 4 measurement locations running. I again put out my plea for more volunteers to host GrabPERF measurement locations. I have had one volunteer contact me about this (thanks Henrik! ), and this location should be up in about 3 weeks. If you have a spare linux box and a static IP, have I got a project for you! PS: The contact page is fixed. It was set to auto-refresh and overwrite your e-mails. Ooooops.